Clean My Chrome is the PUP that uses misleading techniques to prevent removal. Use Reimage to locate malicious components and get rid of them faster than with uninstall instructions. A full system scan blocks virus reappearance and prevents traffic to malicious domains. 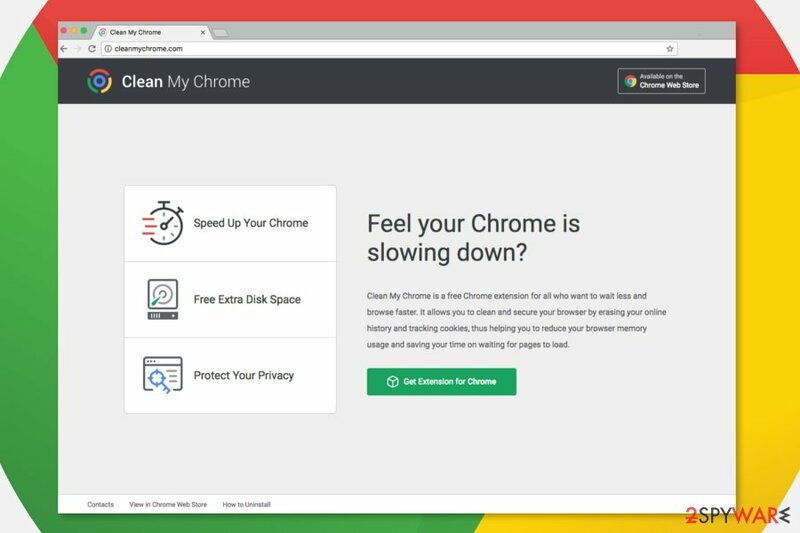 Clean My Chrome is a browser extension that claims to speed up Chrome’s performance and protect user’s privacy. However, this tool might hijack your browser and delivers lots of intrusive ads. Due to these reasons, it is known as potentially unwanted program (PUP) and adware. alter browser’s homepage or/and default search engine. The increased amount of online ads give an opposite result that the official website of the Chrome extension tells. The browser might become sluggish or freeze due to the aggressive pop-ups. Though, security experts pay the biggest attention to Clean My Chrome redirect problems. The adware might redirect to Internet sites that are created for spreading malware or phishing attacks. Typically, Clean My Chrome ads provide various shopping offers. However, they might also deliver misleading security alerts or offer to scan the computer with unknown security software. Clicking such ads or downloading offered tools might end up with ransomware or Trojan attack. Thus, you should stay away from them. The main purpose of the Clean My Chrome adware is to generate pay-per-click revenue to the developers. Unfortunately, they do not care about users’ security and partners’ credibility. Thus, evil-minded people can easily take advantage of this program. All the reasons above should be more than enough to remove Clean My Chrome from the browser. Users from the UK reported that they were not able to uninstall the extension normally. Indeed, it might happen. Potentially unwanted program might alter Registry and browser’s settings to strengthen itself. To reject all the changes and get rid of the adware efficiently, you have to employ a professional anti-malware. We highly recommend Reimage for Clean My Chrome removal. 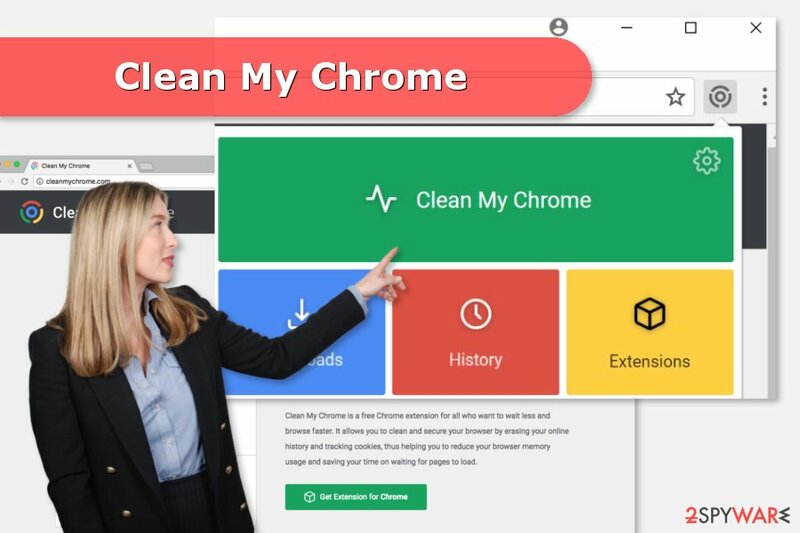 Clean My Chrome virus might be installed to the browser without user's permission. Nevertheless, the extension has an official website and claims to available on Chrome store; there’s no way you can download the extension from here. “Get Extension for Chrome” button is inactive and the link to Chrome store is not working too. It means the adware is being distributed using other channels. The primary distribution method is known under the term “bundling.” The PUP spreads as an optional component in the software bundles and might be installed when a user relies on Quick/Standard/Recommended setup. These settings do not openly disclose about third-party software. So, Clean My Chrome hijack becomes silent. For this reason, you should only use Advanced/Custom setup which allows rejecting installation of additional apps. Clean My Chrome removal might be complicated because the extension might get installed using Windows group policies. Therefore, if you cannot access the list of extension or cannot choose “Uninstall” option, you should not hesitate and employ powerful anti-malware. Otherwise, you can remove Clean My Chrome manually. The instructions below will guide you through this procedure. Once you remove the extension, don’t forget to look up for other suspicious entries that may have been installed as well. Here, look for Clean My Chrome or any other recently installed suspicious programs. Wait until you see Applications folder and look for Clean My Chrome or any other suspicious programs on it. Now right click on every of such entries and select Move to Trash. When in the new window, check Delete personal settings and select Reset again to complete Clean My Chrome removal. Once these steps are finished, Clean My Chrome should be removed from your Microsoft Edge browser. Here, select Clean My Chrome and other questionable plugins. Click Remove to delete these entries. Now you will see Reset Firefox to its default state message with Reset Firefox button. Click this button for several times and complete Clean My Chrome removal. Here, select Clean My Chrome and other malicious plugins and select trash icon to delete these entries. Click Reset to confirm this action and complete Clean My Chrome removal. Here, select Extensions and look for Clean My Chrome or other suspicious entries. Click on the Uninstall button to get rid each of them. Now you will see a detailed dialog window filled with reset options. All of those options are usually checked, but you can specify which of them you want to reset. Click the Reset button to complete Clean My Chrome removal process. ^ Adware. Computer Hope. The website about computers. ^ Violet Blue. You say advertising, I say block that malware. Engadget. Technology news and reviews. ^ NoVirus. NoVirus. British spyware and security news. This entry was posted on 2017-09-21 at 02:31 and is filed under Adware, Viruses. You can quickly scan the QR code with your mobile device and have Clean My Chrome virus manual removal instructions right in your pocket. How did you remove Clean My Chrome virus?